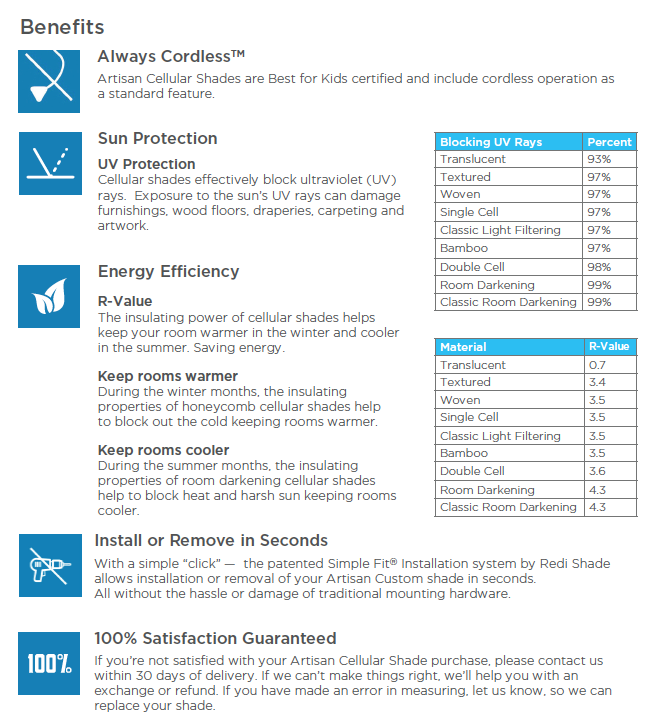 Select the shade type below for technical specifications on different Redi Shade products. Simple Fit Installation is available with Inside Mount only. Outside Mount is available upon request. Please contact us for more information on Outside Mount options. Head to the measure and install pages to learn how to measure and install Artisan Custom shades with Simple Fit. 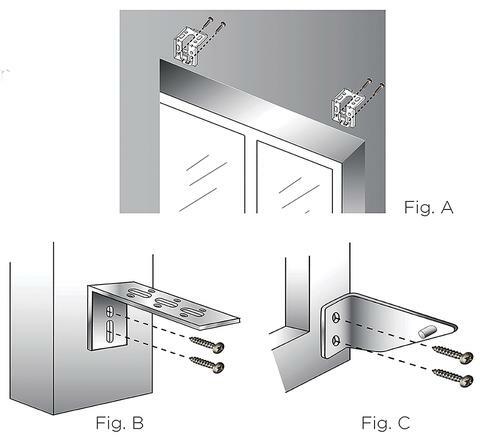 Hold Down brackets are available for securing the bottom rail in place. 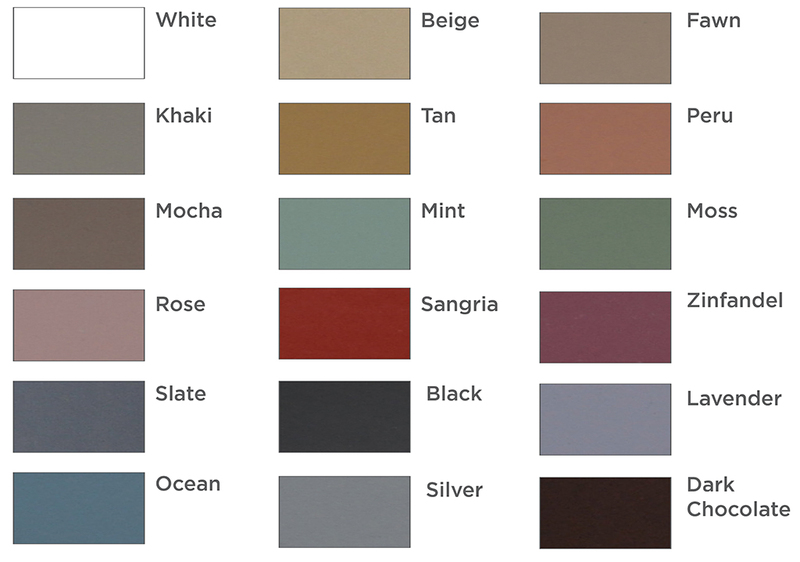 See Figure C.
*Color variation: For best consistency in the color match of your shades, we recommend ordering all the shades for a single room at the same time, as color lot variations may occur between orders. We cannot guarantee color lot match between orders. 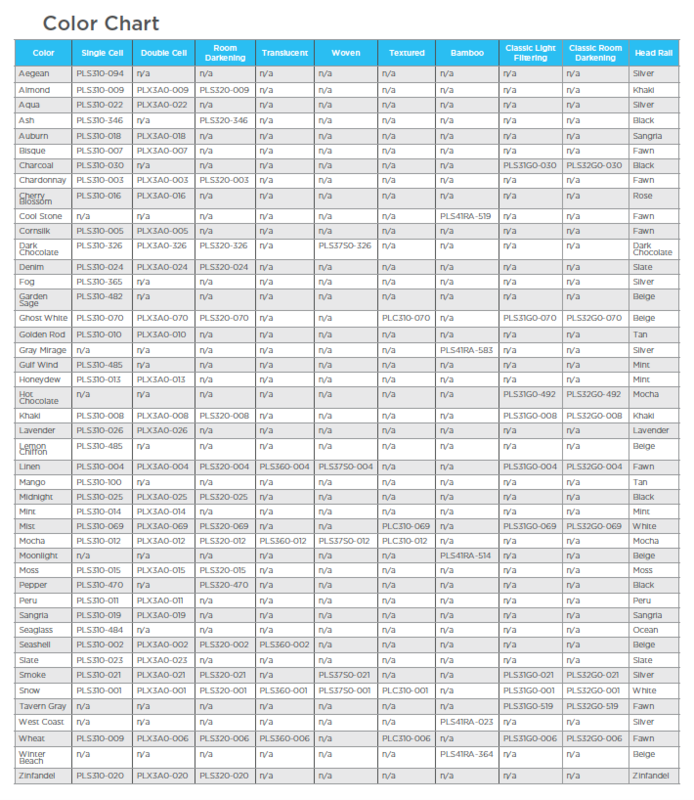 Note: Variation in color lots is within industry standards. Artisan Custom Shades are white to street side. See chart below for corresponding head rail colors. Dusting- To maintain the fresh appearance of your shade, with a light touch, dust regularly with a feather duster. Vacuuming-Use a vacuum attachment for a deeper clean, being careful not to press too hard as to crease the fabric. Spot Cleaning-Use warm water, mild detergent, and a non-abrasive cloth. Dab lightly or gently rub back and forth in the direction of the fabric pleats. Pat dry to remove excess water and leave the shade fully closed until completely dry. Note: Dry cleaning, full immersion in water, strong detergents, or spot cleaners are not recommended. Head to the FAQ page for more frequently asked questions about Artisan Custom shades. Head to the measure and install pages to learn how to measure and install Artisan Select shades with Simple Fit. Always Cordless Artisan Select Shades include cordless operation as a standard feature. Open from the bottom to adjust light control and privacy. Simple Fit™ Installation Method allows you to place your shade at the top or middle inside your window. Artisan Select Shades include cordless operation as a standard feature. 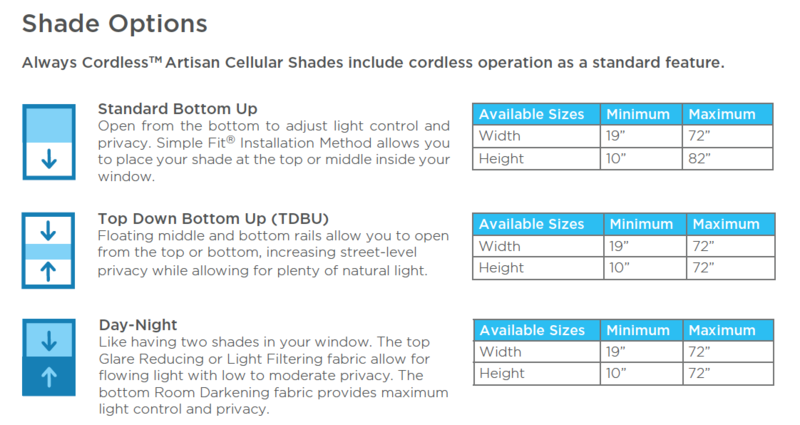 Cellular shades effectively block ultraviolet (UV) rays. Exposure to the sun’s UV rays can damage furnishings, wood floors, draperies, carpeting and artwork. The insulating power of cellular shades helps keep your room warmer in the winter and cooler in the summer. Saving energy. During the winter months, the insulating properties of honeycomb cellular shades help to block out the cold keeping rooms warmer. properties of room darkening cellular shades help to block heat and harsh sun keeping rooms cooler. Artisan Select Shades are white to street side. Head to the FAQ page for more frequently asked questions about Artisan Select shades. Head to the measure page to learn more about measuring your Easy Lift Shade. Head to the installation page to learn more about installing your Easy Lift Shade. Lightly dust or vacuum with upholstery attachment. For spot cleaning lightly blot with mild detergent and warm water. The shade is not intended for dry cleaning, spot removers, strong detergent or full water immersion. If your shade becomes unbalanced and hangs unevenly, open gently to full length to reset. Head to the FAQ page for more frequently asked questions about Easy Lift shades. Head to the measure page to learn more about measuring your Original Shade. Head to the installation page to learn more about installing your Original Shade. Light Filtering- Original light filtering shades gently filter light while providing partial privacy, UV protection and glare reduction. Light Blocking- Original light blocking shades provide the next level of light control. Blocking light for enhanced privacy, glare reduction and UV protection. Room Darkening- Original room darkening shades reduce nighttime shadowing and block a majority of light while creating privacy, and providing UV and glare control. Blackout- Original blackout shades block 99% of light for complete privacy, light control, and UV protection. Ideal for bedrooms, children’s rooms and media rooms. Paper Original shades are available in light filtering, room darkening and blackout. They are made of durable paper that will not yellow and crack from sun exposure. Fabric Original shades are available in light filtering and light blocking. They are made of soft, 100% non-woven polyester. Light blocking Original fabric shades are made of non-woven polyester with a heat reflective layer that helps block heat entering through windows. All Original shades are recyclable and made in the USA. Original shades are always cordless for easy operation and clean appearance – safe for children and pets. These shades raise and lower with included clips. Head to the FAQ page for more frequently asked questions about Original shades. Head to the measure page to learn more about measuring your Sheer View Shade. Head to the installation page to learn more about installing your Sheer View Shade. Glare Reducing: Sheer View Shades are glare reducing which allows you keep your daytime view and privacy while cutting harsh sunlight and glare, reducing heat and harmful UV rays with it’s UV blocking Solar Fabric. This shade can be layered with other window treatments for nighttime privacy. Sheer View Shades are made of non-woven polyester & exclusive light blocking composite. Head to the FAQ page for more frequently asked questions about Sheer View shades. Head to the measure page to learn more about measuring your Original Arch Shade. Head to the installation page to learn more about installing your Original Arch Shade. Light Filtering: Redi Shade Original Arch shades gently filters light while providing partial privacy, UV protection and glare reduction. Redi Shade Original Arch shades are made of 100% non-woven polyester. Arch shades are always cordless for a clean appearance – safe for children and pets. Head to the FAQ page for more frequently asked questions about Original Arch shades.